This afternoon Penn State head coach Cael Sanderson announced that freshman 125 lber Gavin Teasdale will be removed from the Nittany Lions roster and is looking to transfer. This is the second time this school year that Teasdale has left the team. 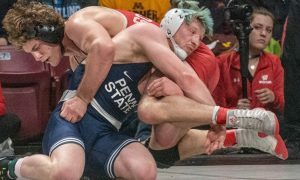 In late November, Teasdale left the school citing “health reasons.” He was added back onto the PSU roster shortly before the Southern Scuffle on New Year’s Day and expected to compete at the event. At one point Gavin’s name was in the brackets; however, it was removed before the competition started and he has not wrestled this year for Penn State or even unattached. 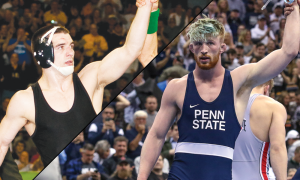 Teasdale came to Penn State after a storied high school career where he had won four Pennsylvania state titles and was undefeated through three-plus years of high school competition. He was the ninth-ranked recruit in the Class of 2018 by The Open Mat. We are monitoring Teasdale’s situation and will provide an update on his transfer status when available.